I’ve been working with marbled acrylic paints for almost a year. It is quite a challenge to mix the ‘jello’ thick enough to hold vivid acrylic colors. Traditionally, the paints are thinned out so they float better, which gives the more pastel colors more typically seen in traditional marbled patterns. I’m learning to draw scrolls, so working with the many loops in marbled paint feels like a very free adaptation of scroll design. 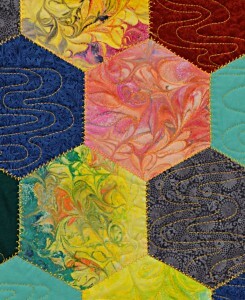 These blocks provide many paths for free-motion machine quilting. Once again, they show to best advantage when placed among traditional quilting fabrics in small patterns (calicoes) and solid colors. In addition to fabric hexagons, I used the marbled acrylics on our 2015 Christmas ornaments. The 3D marbling is even more unpredictable! This entry was posted on Tuesday, March 1st, 2016 at 9:42 pm	and is filed under Fiber. You can follow any responses to this entry through the RSS 2.0 feed. Both comments and pings are currently closed.